While working at my job at Philip Funnell Motorcycles in Vancouver British Columbia, from time to time a used bike would come up for offer. Not very often one would come along that would fit my special criteria (that being, the right price and in running condition). In time, the right one came along. Fred McClellan was a safety inspector for the city; Bud (as folks called him) would stop by on his 1967 R60 with some frequency. Bud took pretty good care of his bike and enjoyed riding it, so when it came up for sale I jumped on it. My new R-60 with all the bags and fairing removed. 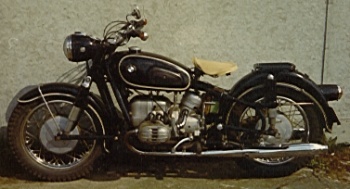 Years before, Philip had a 1957 R50 he toured the world on and always had stories of his journeys. I, being an impressionable teen, thought it sounded like fun, so I too wanted to become a world traveler. Seeing as he still had all the old touring equipment off his old bike, he gave it all to me. The only thing that was missing was the large gas tank he made. As luck would have it, the gas tank turned up in the trunk of a car one day for twenty dollars. Philip knew the condition the old touring equipment was in and thats probably the reason he gave it to me for free. Gosh, I spent weeks after work grinding, taping, shaping and fiber glassing. Then again, grinding, taping, shaping and fiber glassing over again and again, I started to like the way it was all coming out. After slopping a couple of coats of black paint on the finished equipment, I was ready to hit the open road. Only a couple of small problems got in my way, Ive never traveled anywhere on my own and the big problem, I didnt have any money. Well, maybe instead of the world, I could start off a little more locally. "Pokie Pig" ready for the road. Enter; Peter McEwan and Martin Doyle (a couple of customers that became employees) that started a BMW repair shop in Kamloops. Whenever I saw them or talked to them on the phone, they would ask me to come visit. Ok, so it wasnt camping rough in the wilds of Kashmir but I was at least getting away from the ordinary on my motorcycle. I went out to Kamloops a lot, not every weekend but a lot. I got to know where to stop for food, gas and where the local radar traps liked to hide. The last piece to turn up, the fuel tank. On one uneventful trip back from Kamloops, I stopped at Cache Creek for fuel, like usual. When I turned the bike off, the motor made a funny clank sound. I didnt think anything more than Thats funny and let it go at that. After filling my tank and using the facilities, I was ready to head home. I rolled The Pig (at this point that was its name) off its stand and prepared to prod the kick start. When I brought the kick start into mesh, it stuck hard. Well, thats not right I said as I squeezed up the clutch and tried again. Again the kick start stuck. At this point I knew there was a problem, I just didnt know exactly where the problem was. In 1967, BMW had a problem with the metallurgy of their heads, in time the valve seats would just fall out. For some reason I didnt think this bike was affected, I guess I was just proven wrong. Ok, I knew what the problem was, I just didnt know which head was at fault. I pushed the Bloody Pig behind the gas station (away from prying eyes) to figure out what to do. I removed the right rocker cover to check things out and wouldnt you know it, that was the side with the problem. My cure, I pulled out the valves, blocked off the fuel and road it home on one cylinder. Decorating the Pig's rear box. Of course getting home from Cache Creek on one cylinder wasnt without its ups and downs. The best I could do on the flats was only about 35mph, downhill I could do about 45mph, but uphill was the real problem. You have to imagine for a moment, the year was 1974, the road ran up and down like a snake on a frying pan (Fraser Canyon), add to this heavy single lane traffic. I could hold my own going downhill but on the uphill sections I had to wrestle The Pig onto the shoulder (about a 3 hump) so as not to be a hazard to the following traffic. Wrestling the hump was not a pleasant task, it usually had to be done at speeds of about 15mph. I never came to grief while doing this maneuver but there were some hairy moments with huge semi-trucks breathing down my neck. At the town of Hope I could breath a sigh of relief as at this point I could jump off hwy 1 onto hwy 7. In comparison, the traffic on hwy 7 was light and traveled at a slower pace. Entering the lower mainland I felt I was home free, yea right. For some reason, I totally forgot at one point this quiet road leaves the valley floor, curls up and around a mountain only to slowly drop back down to the valley floor some miles further on. My first attempt only got me half way up before having to turn around and putter back down. How could I have been so stupid to have forgotten about this summit, I couldnt help but feel I was too close to go back and find another way around. Once back at the bottom, I rode a ways on before turning back around to face my demon. Attacking once more, as I went through the gears trying to get the most out of each one. Even laying down on the tank, trying to get more speed. Maxing out in top gear Pig and I started up, dropping gears to keep the revs up. About three quarters up, all power fell away and I had to turn around once again. Making my mind up, if I dont make it this time, Ill go back and find another way around. When I approached my last starting point, I thought I should get more run, so I rode on. I turned to face the hill again. Taking a deep breath, Pig and I were off. Again, pulling all the power I could out of each gear, laying on the tank with my feet on the rear pegs, together we attacked the hill again. Up and up but running out of power much closer to the top. Without missing a beat, I leapt off the seat and started running beside Pig. Without my weight on Pig enough power was had to get us closer to destiny. As Pig and I approached the summit, Pig was again laboring. Within about ten more feet of road I could feel Pigs power start to surge, we had cleared the summit! Once back home, I pulled Pigs heads and found the struggle back was at a price. Instead of rebuilding the heads, I now needed pistons as well. No shortcuts for me, while it was down, I did the whole engine. I had gotton fed-up with the fairing, so off it came and the original headlight refitted. I found a front fender that suited my "off road" preference. This photo was taken at Morgan Hill. While Pig was in its World Touring guise, I had a number of adventures with it. I visited parts of Canada Id never been as well as riding south into the USA. My brother was looking for adventure as well, so this year (the previous year he rode on the back of Pig), with his own bike, we rode to Morgan Hill, CA. 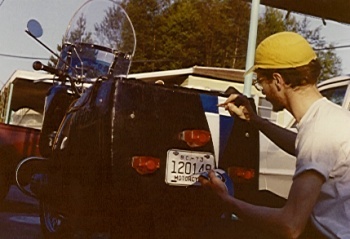 The only real adventure going there and back was trying to find gas, remember the Embargo? This was the year at the Forty-Niner Rally, I pulled off the big touring box and entered the Trials and left with first prize. The real reason I remember that rally so well was a girl I met, little did I know at the time we would become life mates but thats another story. While at the rally, I was smitten by a mechanical accessory, a sidecar! I didnt know much about them but when I got home, I needed to know more. A friend of mine (Peter McEwan) had a sidecar for sale at a price I could afford. I had never mounted a sidecar before, nor did I know much about the alignments required for one. 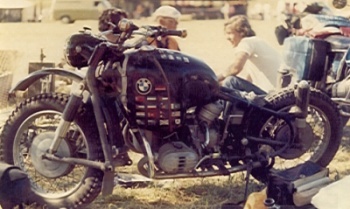 Years before, I had acquired an older BMW repair manual that had a section about mounting a sidecar, that became my bible. Back to basics, ready for the new sidecar. The seat looks a little funny as it is off a NSU. 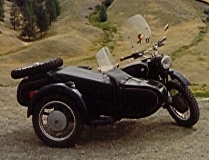 Turns out the sidecar I had bought was built by a section of Jaguar in about 1936, a Swallow. 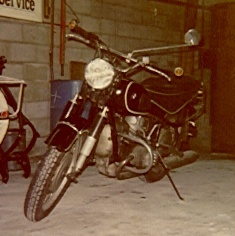 I never knew the correct model name of the Swallow but it was a well-built sidecar, sheet steel over a hardwood frame. My mounting system was made up of what ever I could find at the local hardware store mixed with my farmer-like ability of sticking metal bits together, referred by others loosely as welding. The sidecar and my fancy world touring equipment didnt get along together, so I returned the bike to stock trim. I never got a fender with the sidecar but I made do with a used BMW fender I had left from another project. The Swallow just after testing, it was a lot of fun. Riding on three wheels now allowed me to go all kinds of places at all kinds of times of the year. For passenger comfort, I kept a cow skin lap-rug stored on the tail of the sidecar. I also made a lap-rug for myself to use on the bike but I still had COLD problems. My way to deal with this COLD problem was to upgrade the bike to high output 12 volt electrics. I bought an electric vest and handgrip warmers and eventually bought a heated suit. For a little extra power, I mounted a large snowmobile battery in the back of the sidecar. Because the bike didnt require power to run (magneto), I could run an extension cord to my tent (or whatever) and have heat until the battery went flat. 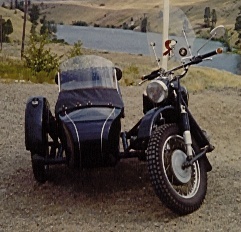 The Ural sidecar, note the return of the off road fender. 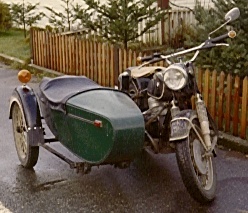 The Swallow gave me about a year and a halfs worth of fun before being replaced with a Russian Ural sidecar. I sold the Swallow to Paul Dupre, who restored the Swallow to its rightful state and sold it to a collector. 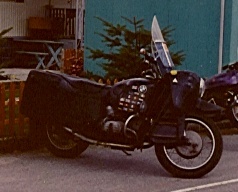 Paul also bought an R69/S BMW with a Watsonian sidecar; we could be seen riding together from time to time on adventures about the Lower Mainland. I wonder what became of Paul? With the addition of the Russian sidecar, Pig became Superior Pig or in Russian, Looch Sha Ya Schwinya. I know its spelled wrong but thats what I remember. I again mounted a large snowmobile battery in the back of the sidecar (just in case) and fitted the axle and spare post with BMW wheels. When one became available, I also fitted the fender with a BMW taillight. One day while visiting Peter McEwan, he gave me a Canadian Post Office sticker as I was a sticker collector. 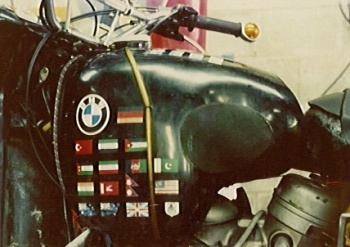 I placed the sticker on the upper nose of the sidecar, making the outfit look very official. With BMW wheels all around, the final touch, the tail light is yet to come. This photo was taken on Hwy 5 between Princeton and Merritt in British Columbia. Dave Metcalfe had entered an Enduro over on the Olympic Peninsula and wanted me to go and join him. At the time I didnt have a bike I could use for such an adventure so, instead, offered to come and lend support. Barb Raymond wanted to go as well and jumped at the offer to ride in the sidecar. Well, we never did find the place where Dave was riding; instead we found all kinds of lonely back roads that usually just ended in the forest. One such road led us to the top of a mountain overlooking the sound where we pitched a tent and spent the night watching the twinkling lights of boats going in and out of the sound. Barb liked so much riding in the sidecar that we would go out to local parks and attractions just for fun. Barb talked about going out and visiting the guys in Kamloops, so that next weekend found us doing just that. We couldnt just ride out there though; it had to be on back roads. Took my usual route from Vancouver to Hope (Route 7), from Hope we found the Kawkowa Lake Road. Followed that to the Merit turn off then shot up to Kamloops from there, took us almost all day, some short-cut. Nearing the end of 1974, I got a call from Carol Plant; she was going to go to Mexico and wanted to know if I would come? Seeing as it was winter and work was slow, I accepted her invitation. With all my winter gear mounted on Superior Pig, I departed British Columbia on a cold, gray and rainy morning. With little more than a shaking head and a wave I zipped through customs and headed south on I-5. It rained all the way into Oregon where the rain turned to slush then to snow. Just before Grants Pass I was stopped by the highway patrol, the officer told me that I should turn around. When I asked if the road was closed, he told me it wasnt but that he expected it would be soon. I informed him I had no intention of turning around and pointed out that I had a studded knobby tire, chains and heated clothing. With a look of disgust, he allowed me past and on my way. As I rode towards Grants Pass the snow came down heavier and heavier. When I stopped at Grants Pass for a very late dinner, I was the only one out on the road. After eating I continued my trek south on into the night. I rode cautiously and never required my studded spare or the chains. I arrived at Carols house that next morning but slept most of the day. Carol and I spent the next couple of days getting ready for our trip to Mexico, when time would allow, I would go visit my girlfriend and her dog Loki. When Carol and I left for Mexico, I hoped I could visit her again on the way back. I guess it would have been useful to learn a little Spanish before taking a trip to Mexico. Throughout the trip, communicating with the locals consisted of talking very loud and waving your arms about, not real bright. Just crossing the border into Mexico was a bit of an adventure; we were waved across the border and sent on our way. No more than 10 miles down the road we were stopped and sent back to the border for not having the correct papers. Back at the border, we had to resort to lots of loud talking and arm waving to get the papers needed to get past the check point. I guess the irritating part was after we had the papers; the checkpoint didnt bother to look at them, typical. We stayed mostly on Route 15 (when we could), at night we stayed in motels or hotels that had guards posted to watch our stuff. I was warned not to drink the water because of pollution so I took to drinking mostly beer, heck; I even brushed my teeth with beer. Everywhere we stopped, curious locals, mostly attracted by my sidecar, often approached us. The restaurants were a little odd at first, but we soon got used to sharing our space with other people as well as dogs and farm animals. I had a problem with the amount of hot sauce the cooks liked to put on their masterpieces and Carol liked to make light of it. One night while dodging farm animals on the road, we happened upon a broken down BMW motorcycle. Leo Jansen (a customer of mine in Vancouver) had bought a new tire and, because of its poor manufacture, would spin on the rim tearing out the valve stem from the tube. Between Leo and I we managed to get his tube replaced while Carol made coffee. Leo traveled with us for a while but parted ways during the New Years festivities in Mazatlan. New years day found Carol and I on the road again, our destination, Acapulco. Two days into the New Year we reached Playa Azul and our campground on the ocean. Camping was made somewhat interesting, as I had forgotten to bring my tent poles with me. Have you ever tried to prop up a tent with Palm fronds? We met several other friends there, Keith Dempster came to my rescue with enough cord to tie my tent up to a couple of Palm trees. After camping out for a couple of days, seeing the sights and trying my hand at body surfing, Carol and I headed back north. I liked to ride rather briskly but always kept Carol in my mirrors. Because of my brisk riding, she wanted to stop and visit with and introduce me to Reg Pridmore. With that thought in mind, I started riding all the faster. I finally slowed down when I had a rather close call with two kids on a Moto Islo. Nobody got hurt and Carol said the kids were laughing when she sailed past them, thats when I decided to keep the speeds down for the remainder of the trip. A little further on, the motor in my bike started to get a little noisy. It didnt occur to Carol that anything was wrong until we stopped in Ciudad Obrigon, Carol tried to talk to me and I just couldnt hear her over the noise my motor was making. Needless to say, we spent the night in Ciudad Obrigon talking over our options. 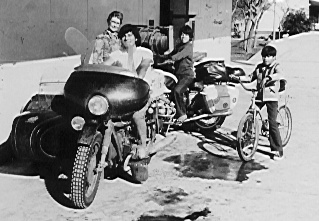 Next day found us draining our gas tanks in preparation to ride the train and shipping our bikes in the baggage car. Riding the train was quite an experience, sharing our space with farm animals again took some getting used to. Getting food on the train only happens at train stations, you hang out the windows and buy from the vendors walking up and down beside the train, we were very careful. The crew of kids that healped us get ready for the train ride, sorry about the gas stains. 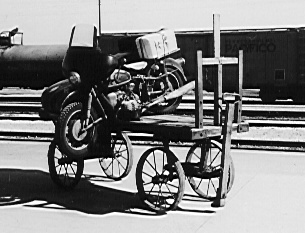 Ready to be loaded onto the train, the big box on the rear carrier rack is an additional eight gallon gas tank. When the train arrived in Nogales, we felt home free with one small exception, we couldnt have our bikes until the next morning. Spending the night sleeping on a heater register in the train station, is as close as I ever want to get to being homeless. It was a pleasant surprise to receive our bikes the next morning, in exactly the shape we left them, nothing damaged or missing. We had left enough gas left in our tanks to get us to a gas station on the Arizona side of the border, where we called Art Jacobson. Art had a shop in Tucson where he offered me room to store and/ or work on my bike. Art took us out to dinner and put us up for the night. Next day I got started working on the bike while Carol packed up and headed home, our little detour by train cost her too much time and she had to get back. 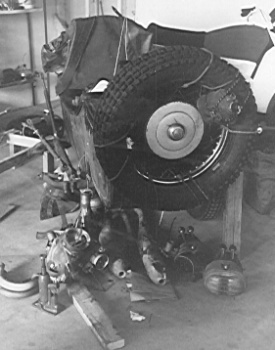 A couple of days later, I had fitted my bikes motor with new main bearings and was again ready to hit the open road. With a very big thank-you to Art and his wife, I headed to Carols house. With the time that was used up, a visit to Regs shop never happened. All apart in the back of Art's shop in Tucson. The trip to Carols house was uneventful but pulling into her garage, the motor made that same funny noise it had made in Cache Creek, a seat in the other head fell out. Herb Bouson (lived with Carol) had a friend to take the head to, Ray Bunch. Ray had a machine shop in his garage and with less time than it took to visit, my head was fixed. I stayed with Carol and Herb for a couple more days just resting up for the trip home. Thankfully, my trip back home to Canada was blessed with fabulous weather and no troubles. The only irritation was being pestered by a fellow while sleeping by my bike at a rest stop in Washington. Seems he was afraid I was hypothermic, even when I showed him my heating system he wouldnt leave me alone, so I climbed back into the saddle and rode the rest of the way home. Upon arriving home and back to work, I was feeling like it was time for a new bike. When Peter heard I was thinking about selling Pig, he got right on the phone. Within a week Pig had a new owner, a small family in Kamloops. I only saw Pig once more after that, still had his sidecar on and the family was still pleased with him. I hope he, as well as they, are still together and still happy.